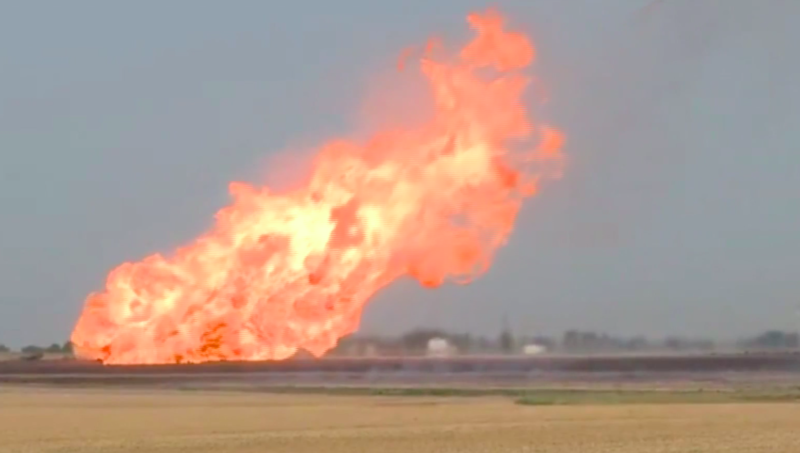 A Southern Star Central Natural Gas pipeline exploded outside Hesston, Kansas, early Friday morning, sending flames shooting 75 to 100 feet into the sky, CBS Wichita affiliate KWCH reports. Southern Star spokesman Rob Southard said that the pipeline was shut off, with the fire burning up what was left. He said finding a cause could take weeks. Capt. Andy Wray, with Hesston Fire & EMS, told KWCH that the fire had spread from the pipeline to the surrounding wheat stubble field and grass, though fire crews were eventually able to contain it. He said support was requested from the American Red Cross and the Harvey County Emergency Response Team due to the heat and the high demand on firefighters. No injuries were reported. Residents were asked to steer clear of the affected area.